It is Holy Wednesday and since yesterday, the Philippine government had declared these days as holy days until Saturday. Normally, holy week is a special time for us Catholic where most us go to church for the readings on the passion and death of Christ while the rest of us, head to recreation destinations including beaches, mountains and entertainment houses. Regardless of how we make use of long holidays, it will not harm us to do self - reflection once in a while and make it a goal to be a good person whenever we can. But, amidst everything, we can choose to have safe fun through any means. Most of my friends play online games particularly, Casinos online where they can win big bonuses from widely varied games through different legitimate casinos. ALL USA players are definitely welcome. It is always fun and refreshing to have a break from long works and pressing jobs. We just have to find means to recharge our energy and it is even more fun, if we share our recreations with loved ones. 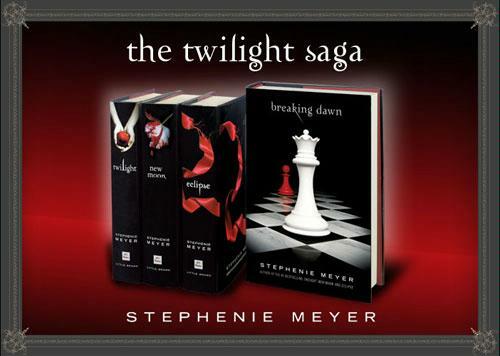 I have read the e-book copies of this popular sequel and I had seen endless times the two movies adapted from these books and I just could not get enough. LOL! I been wanting to buy the books but it made me feel guilty to buy something that I have read already so my husband was kind enough to stall me the buying since he wanted to buy the books himself. And, surprisingly, I got my wrapped books and the nice thing is, they come in complete set in its own box with book covers as freebies. However, I shall only start re-reading it once I am done with my Nicholas Sparks e-book collections. Perhaps, if I like the stuffs, I shall buy the books soon too. Hahhahahah!!!!! After months of extreme heat day and night due to very warm weather and rotating brownouts, flu started to kick in at home. Two other family members are already down with the illness while I battle the symptoms. So, I have been eating citrus fruits and drinking fluids more than necessary. I only wish I can keep my own kid away from illness. As advised by health experts, flu vaccines are highly recommended now that rainy season starts to lurk. I wish they can be cheaper so everyone can have this especially now that A1H1 vaccine is already out for public use. Our school is finally done with second semester that next week, we will hold our final exams. Since I am anticipating the long vacation, I decided to hold off first the checking of papers this weekend. Since requirements of teachers are bound to pile up as the end of semester comes, I am getting more cross eyed with all the reading, blogging and programming. My ophthalmologist did advise me to wear eyeglasses since the nature of my work puts a strain on my vision. But, more often than not, I keep on forgetting them and now they are finally broken. I have to really get a good pair of glasses this time. I read Eric's Review of Zenni Optical and I was pretty amazed that anyone can get the Lowest Price Progressive Glasses starting at $8.00 way much cheaper than other eye glasses. Further, any add – ons like anti – glare coating comes at $4.95 as opposed to $50-$100 elsewhere. The #1 online Rx glasses store is a click away and any shipping is only at $4.95 regardless of the pairs needed. More importantly, a wide selection of eye glasses for men and women can be checked and customized to their unique needs. This is really one best deal! T o top it all, not only that I shall be getting quality eyeglasses, I shall be having elegant and stylish frames. I shall really soon my ophthalmologist again and ask for my vision status and place that online order for eyeglasses. We are almost done with our teaching job this second semester and the requirements are starting to pile up. For one, I have been stressed knowing that anytime my supervisors shall come in for the observations. Although one boss already came in, I am still expecting another visit or two. So, the preparations and stress make me more dizzy. LOL!!!! I could only be hopeful because next week will be the last week of class and examinations. After which, we are drawn to completing the requirements before clearance is needed. The vacation time shall give me more time to spend with my kid and and business. We are now working on constructing the mall space this summer. So, until then, I just have to relax and just be easy with work. Sigh! LOL! Having to work every day in teaching and in business can be really draining. Sometimes, I hung around the mall for a window shopping but sometimes, this too can be depressing. Whenever we can, I bring my kid to the city playground and just relax while watching over him. But, when all the teaching requirements and business toils pile up, gosh, I wish I can disappear. LOL!!!! So, it helps when recreations like online casinos particularly USA casino can be checked and played with. The oldies in Wisconsin sometimes, do check this site for harmless fun and getaway from regular works and stress. The site actually lists all legitimate casinos in USA with reviews that anyone can check and assess to fit his unique needs. Further, specific games can be chosen from their wide collections of game plus bonuses to boost with. COOL!!!! 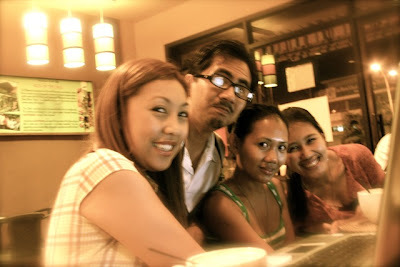 To get recharged and be motivated to go to work, we must have fun whenever we can. Otherwise, every day can be depressing and dragging that we become less productive and more grumpy. Any recreation will do, but we have to make sure that they don't come as a burden to us nor to our family. Harmless fun is better indeed! 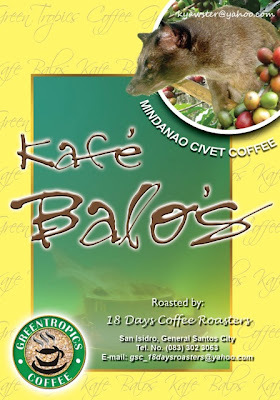 Kafe Balo's that serve what the world considers the most expensive coffee, Weasel Coffee or Civet Coffee, produced by the Asian Palm Civet as their poofs!!!! 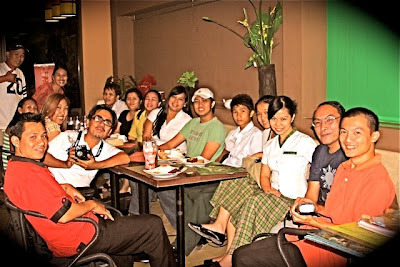 As a blogging community in the region, we normally hung out in some establishments here. 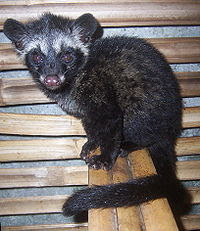 We had this coffee time with Generals' Brew where they serve the unique coffee luak where they are uniquely taken from the poofs from Asian Palm Civet. Did I try drinking this coffee?!! No way! LOL!